The Albatros D.I was initially designed and produced to counter the Nieuport and de Havilland series of "Fighting Scout" aircraft, winning superiority back by 1917. Initial D.I's were modelled after the Albatros "C" series of aircraft, including some of the internal working components and overall building methodology used in production. The D.I and D.II represented Germany's second successful bid within a year to gain total air superiority over the Allies (the first with the Fokker E monoplanes in 1915-16). They were vast improvements over the previous Fokker and Halberstadt biplane fighters. They were an unequal-span equal-chord biplane with a plywood-covered semi-monocoque fuselage, having the Albatros C.III rounded tailplane coupled with the new rounded fin and rudder of C.V/16 type. 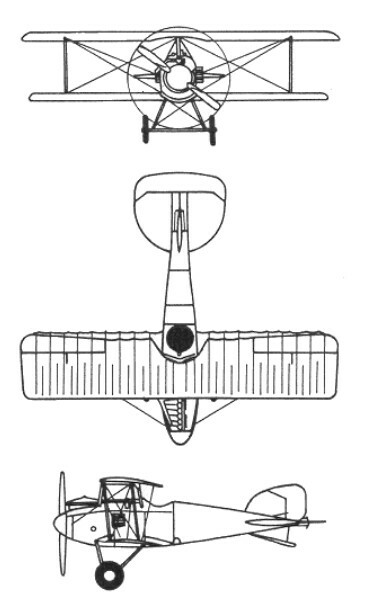 The major difference between the D.I and D.II was that the upper wing of the D.II was lowered to reduce the gap between it and the fuselage to improve forward and upper vision. Powered by either a 112kW Benz Bz.II or 119kW Mercedes D.III engine they armed with two synchronized Spandau machine-guns, firing through the propeller - the first successful installation of twin guns on a German fighter. The D.I first flew in August 1916, and were first flown on an operational mission in September 1916, led by the ace Oswald Boelcke. Twenty D.II, powered by 138kW Austro-Daimler engines, were also licence-built by the Oeffag company for the Austro-Hungarian Air Force. At the peak of their operational careers with the German Air Force, about 260 D.I and D.II fighters were in service. In October 1916 the D.1 was replaced in production by the D.II.